Above we can see the performance of the S&P GSCI commodity index over the past several years. 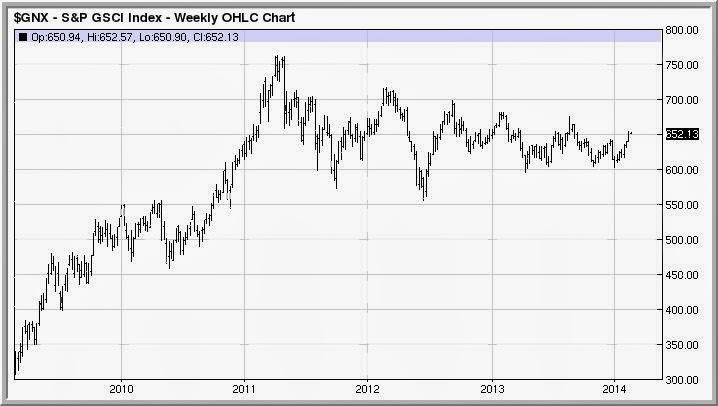 It's an interesting chart and helps explain why commodities traders have not had an easy time of it recently. You can see that the volatility of prices--as well as the trend--have been crushed in a steady grind. Momentum and trend traders are likely to perform poorly in such an environment. From 2009 to early 2011, however, those traders probably did well, as volatility and trend had ramped higher. It's a great illustration of how markets--and even asset classes--can shift "regimes". They play by one set of direction and volatility rules in one environment and then follow a completely different set of rules in another. Any trader who conducted historical studies in the GSCI to anticipate future price patterns was at risk of extrapolating from a past to a greatly changed present and future. You could imagine that a trading system based on yesterday's regime could backtest wonderfully and then fail miserably once the market trades by a different set of rules. If good trading simply were a matter of planning and exercising discipline in following plans, many more people would succeed at it. Disciplined plan-following works well when regimes are relatively constant. Once markets start playing by a different set of rules, however, the challenge is to adapt--not just double down on rigidly following old strategies. Realized volatility in the stock market has percolated higher of late. Is this part of a regime shift or do the old market rules apply? Can we extrapolate from the past--say 2013--to anticipate market movement in the near future, or do we need to figure out the new market rules before making inferences? I spent a good chunk of my weekend reworking my regression models for stocks precisely because I detected the underlying rules were shifting. What builds a career of trading success is the ability to recognize change and adapt to it. At some point there will be a volatility breakout in GSCI and commodities will become a very different performance game. It's the adaptive trader that will recognize the game shift early, avoid getting run over, and profit from emerging trends. It helps to have conviction in your trading, but longevity requires flexibility in conviction.